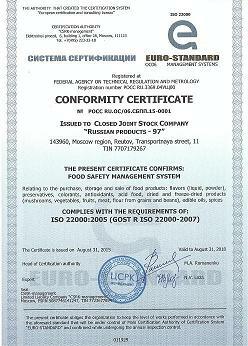 JSC “Russian products-97” was founded in 1997 in Moscow. It has got more than fifteen years experience of work with food industry enterprises. In 2015 we received ISO 22000:2005 Certificate of Food Safety Management System. In spite of small dosages of some food ingredients, they have a great influence on taste characteristics of final products. Since the beginning of our business, having made a careful study of demand for food ingredients, we have been supplying to Russian market ingredients only of high quality. Now we have a broad range of so-called warehousing goods consisting of ingredients widely used in manufacturing of food products. In connection with more than ten years experience of cooperation with “Chemical and Food Aromatic Plant” LLC, we consider domestic flavorings to be one of the principal items of our business. Thanks to regular information exchange, we are not only competent in new areas of the Plant, but we can easily inform it’s specialists of customers’ desires from adding specified nuances of “taste” to a ready flavoring to development of new one that meets the requirements of a concrete factory. Flavorings of “Chemical and Food Aromatic Plant” LLC are used in all fields of food industry. The necessity of taking into account our customers’ high requirements to the quality of ingredients definites our cooperation with reliable suppliers we fully trust. They are world leading manufacturers . Regular audit of their facilities is carried out. Managers of JSC “Russian Products-97” have got a great experience in their work. We can organize competent consultations concerning our ingredients, if necessary, together with the specialists of our partners. We take part in special exhibitions that makes it possible to possess information about new trends of food market, from the assortment of products to changes of the market’s structure. It should be noted that the location of our Company is very convenient. Our office and warehouse are situated in the same place in the East of Moscow Ring Road. Under the circumstances it is easy for trailer trucks to get to our warehouse. Our Company has got several affiliate in Russia.